ACS of injection molding, oil production and other production cycles. ACS TP "on a turn-key basis"
The central part of the ACS TP is the software and hardware complex "Tornado". 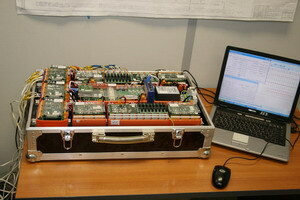 All the most important elements of the PTC, including industrial computers, are designed taking into account the requirements for technological equipment in Russia, are fault-tolerant and have high reliability indicators. The company «Tornado Modular Systems» offers a line of standard design-assembled DCS of high factory readiness, not requiring the development of project documentation (by customer) created and implemented by the company and its partners. 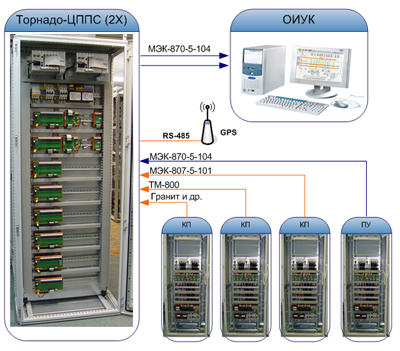 We offer a modern telemechanics complex, designed for the construction of ADCU systems and integrated into the automated process control systems on network enterprise. The telemechanics system ensures the functioning of the dispatching management services, relay protection and automation, operational services of electrical equipment and others. The Tornado-TM telemechanics complex was recommended by the Interdepartmental Commission of FGC (Federal Grid Company) for use at UNEG facilities.